Lately I have been rereading some of Ranciere's The Philosopher and his Poor, specifically the interpretation of Plato's Republic. Ranciere underlines a very basic point, that the definition of justice that we get in Book IV (doing one's own work and not meddling) is a repetition of what was already stated in Book II as an essentially economic argument, that every person must dedicate him or herself to one job. "The image of justice is the division of labor that already organizes the healthy city." Thus, a political principle (that of justice) rests on what is taken as a social fact, the division of labor. Ranciere's argument actually goes a step further, to point out that what supports the social fact is a particular understanding of time. "The Platonic statement, affirming that the workers had no time to do two things at the same time, had to be taken as a definition of the worker in terms of the distribution of the sensible: the worker is he who has no time to do anything but his own work." It is not that political distinctions rest ultimately on social distinctions, as superstructure on base, but that both rest on a particular structure of experience, what Ranciere calls the distribution of the sensible. 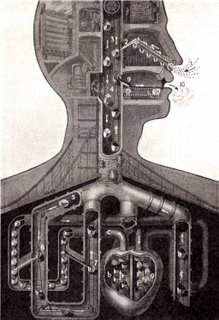 The distribution of the sensible, "the system of self-evident facts of sense perception that simultaneously discloses the existence of something in common and the delimitations that define the respective parts and positions within it," is what links the social and the political, naturalizing them both. In the work of Etienne Balibar, the concept which does the same work, bringing together and naturalizing the political order and the social order is "anthropological difference. "Balibar's conception of "anthropological difference" is not a return to pure speculation about the nature of man, as if the various critiques (feminist, post-colonial, post-structural, etc.) of this object had never taken place, but rather an investigation into the unstable, but unavoidable question, or image, of the human. "Anthropological difference" is a difference that fulfills two conditions: first, it is a necessary component of any definition of the human (such as language); and second, it invokes a division which can never finally be rigorously drawn. Examples of this would include sexual difference and the difference between sickness and health. In each case there is no division of humanity into men and women (or the healthy and the sick) without remainders, intersections, and identities that would ultimately need to be policed and patrolled. Balibar includes the division of mental and manual labor, or what he calls "intellectual difference", within this category. Humankind cannot be defined without the idea of thought (as Spinoza writes: "Man Thinks"), but this general definition is divided by the practices and institutions which determine and dictate the division between the "ignorant" and the "educated" or between "manual" and "mental" labor. These concepts "distribution of the sensible" and "anthropological difference" are what I would call "meta-ideological." Ideological in that there is a reinforcing of the political order by the social order, and vice versa. "Meta" in that this takes place not through a set of concepts or a doctrine, in the sense of this or that ideology, but through the way the very way in which the world is experienced. Of course this experience is structured by various practices. As the very title of Ranciere's The Nights of Labor makes clear, the division between day and night, and the cycles of work and rest, effectively silences workers. "That is, relations between workers' practice--located in private space and in a definite temporal alternation of labor and rest--and a form of visibility that equated to their public invisibility relations between their practice and the presupposition of a certain kind of body, of the capacities and incapacities of that body--the first of which being their incapacity to voice their experience as a common experience in the universal language of public argumentation." I apologize to the entire Francophone world, but I just cannot get accents to work with this "blog" thing. 1) In Ranciere, Plato's "time," is not merely a "dichotomous" division. The workers' "day and night" is how their sensible existence is structured, how their lived experience is shaped (or determined? ): this is not merely a question of free vs. unfree time, but how the "totality" of what is here called time is creative or trasnformative (you'd use "productive"). 2) Balibar's difference, anthropological, intellectual or sexual, is precisely about what cannot be contained in a simple differentiation (a linear, causal, and determinate disctinction) and is an "erasure" of that differentiation in ways that both acknowledge the disctinction between two "poles" AND their non-distinction (or rather the impossibility of such a distinction), doing what the dialectic would in its 4th moment (where absence overrides presence). This a lot of nothing! While this may sound totalizing, most important thinkers of the late 20th century have been struggling with this issue: it is not a philosophical issue (even though it is na attempt to go beyond Aristotelian and Kantian premisses), and it is not a social and political issue (of looking into modes of producing, controlling, and transforming practices of subjectivization, social imaginary significations, etc. ), but it is both AND MORE.. That in itsefl is the movement of a dialectic (if not "the" dialectic).